I am honestly so proud of how these aisle runners turned out, I am even more proud of the fact that I thought of them all myself! This was not a Pinterest based idea!! 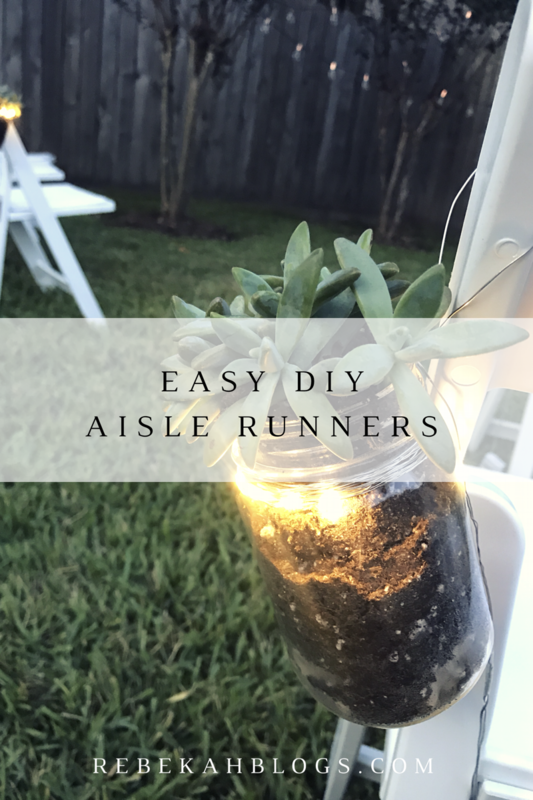 When I was trying to think of what to do for aisle runners I couldn’t come up with something I really liked. I knew I wanted to have cactus involved in some way, but couldn’t think how to have cactus without them being in the way. I actually came up with the idea the day before the wedding. I got some cactus and mason jars and planted the cactus in the mason jars. We tied wire around the mason jar lip and left length at the top so we could hang the mason jars. We wrapped the string lights around the lip where the wire was and tapped the battery back to the back of the legs of the chairs. This is the final product! They turned out perfectly; they were subtle and sweet. It was great because they weren’t in the way of anybody walking which was the goal. They gave the aisle the perfect little touches that we wanted.